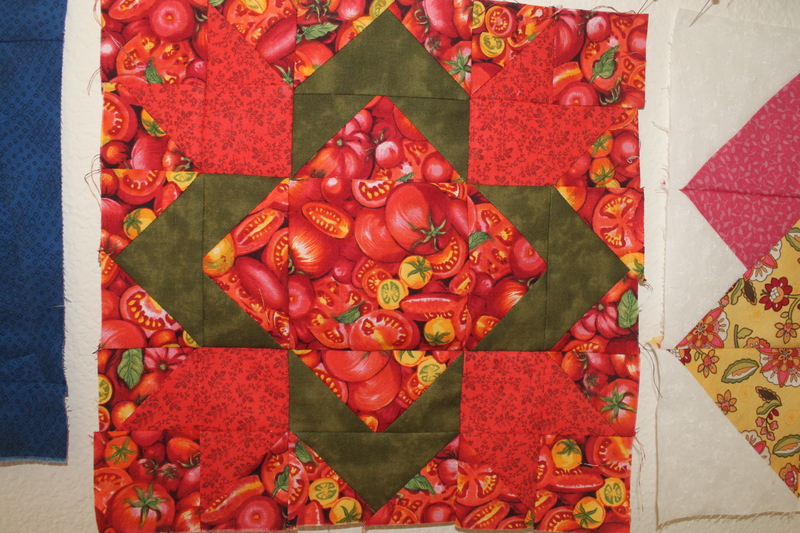 I saw this tomato fabric at Joann’s and just LOVED IT. My thought is to make 4 blocks of laurel leaf pattern, only switch the arrows in the four corners to alternate colors in each block. So in this one they’re red. The others would be yellow, orange, and light green…to match the tomatoes. I like the idea of making them into little placemats, or a small summer quilt, or summer pillows. Now that Autumntime is officially here where I live, I am enjoying seeing these tomatoes and remembering warm summer days. 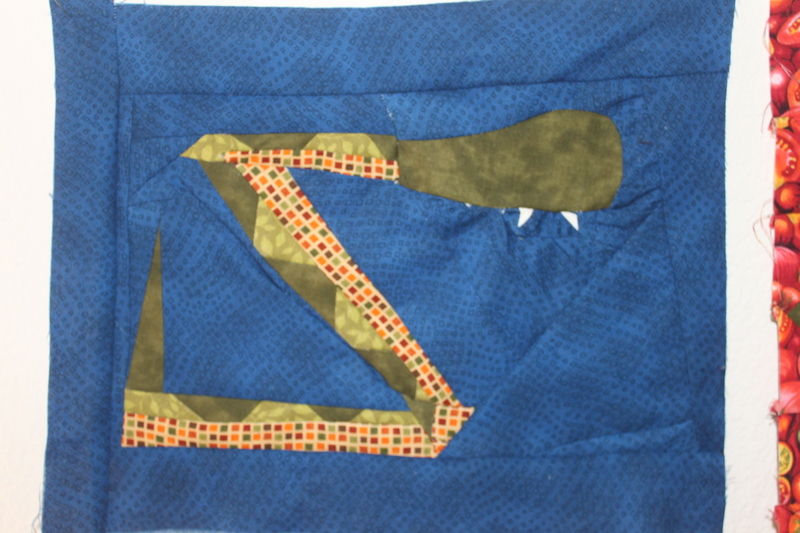 I didn’t publish this on this blog back in the summer when my son decided he needed to help make another block for his Indiana Jones quilt. Voila! You can click here to read more about it. Right now the plan is to sew buttons on for eyes, after the quilt top gets put together. Of course, in order for the quilt top to be put together we’ll need a few more quilt blocks…. I have been wanting to make this block for a long time! I love how it really does look like 4 cards lying on one another. Appropriate as my fourth sampler block methinks! I went with white on the background to match the basket block. The yellow fabric was a no-brainer since I want to incorporate it on as many blocks as possible ( after all it was only the inspiration for the whole quilt, hello! ), the green fabric pulls out some of the light green stems of the yellow print not to mention the yellow swirls give it a little bit more 21st century flair imo. This pink fabric is different than that in the basket block; it is actually the exact shade of pink in several of the blossoms on the yellow print, plus it gives it a pop of bright color that the quilt may really need since it will be primarily browns & greens (or at least that is what it primarily is thus far!). 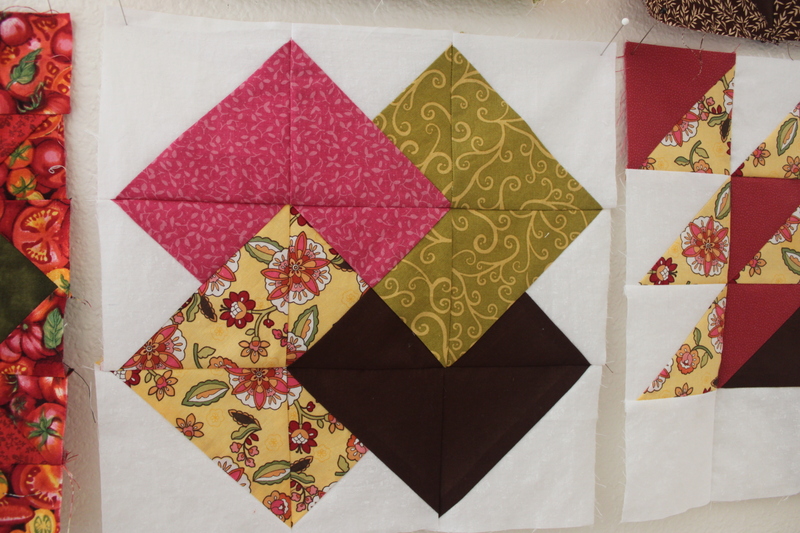 I love this block so much, it almost competes with the Chain block as my favorite block in the sampler so far…. 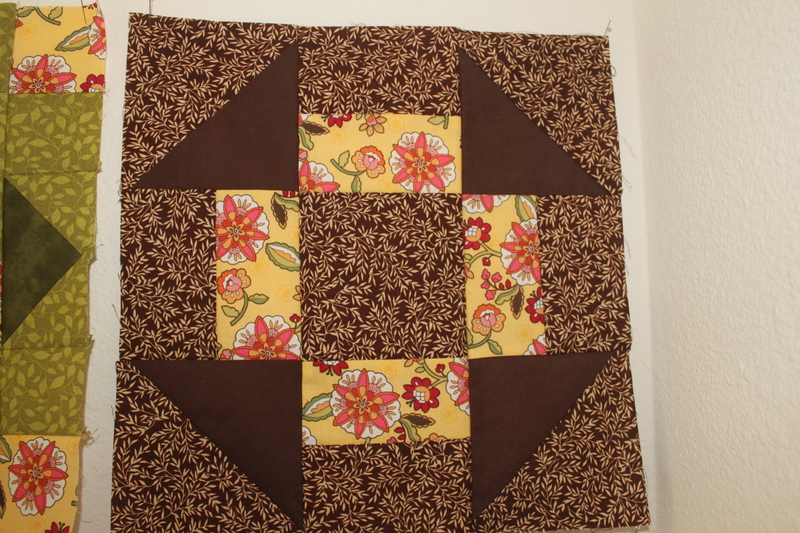 My third block for my quilt sampler: brown & yellow churn dash. There are random brown leaves in the yellow fabric that are easily overlooked; I wanted to make those pop a little more. Hence the brown solid & brown and cream leaf fabrics. Also, I think this block goes really well with the basket block. Here you have a sneak peek at one of my upcoming projects. I’ve already made 5 quilt blocks with this fabric (I’ll need about 30) and I am loving the results. Something about black & white fabric with a little pop of color just makes me happy! 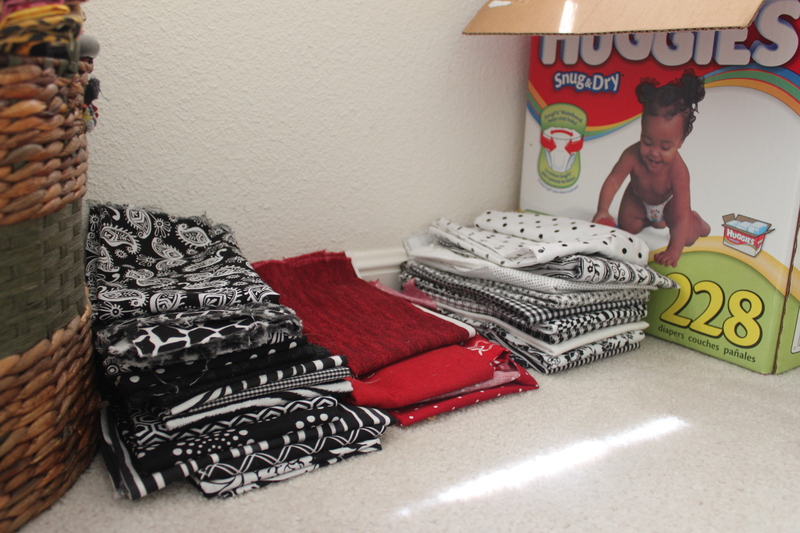 Here is a glimpse of my sewing corner, or should I say the ground in my sewing corner?. 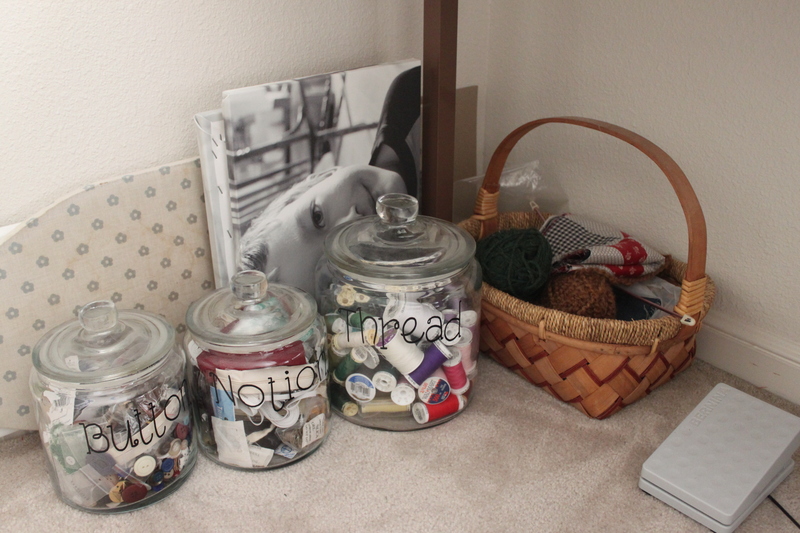 I like keeping my jars of thread, buttons, and notions handy so that I can reach what I need while sitting down. Does this make me lazy? Nah, it makes me EFFICIENT! Yes, exactly that. Oh, and I think the space between the table legs and the wall is the perfect width for my mini-ironing board, and a couple canvases waiting to be hung :). The basket used to be solely for cross-stitch, but over the years it’s accumulated some yarn balls, and quilt blocks still waiting for more friends. I love this little niche because it inspires me to sit down & sew, while still leaving room for the vacuum so it stays relatively clean between projects! August was Valerie H’s month…Valerie was my mentor in my nursing New Grad program. She’s a great lady, and I’m happy to call her my friend. 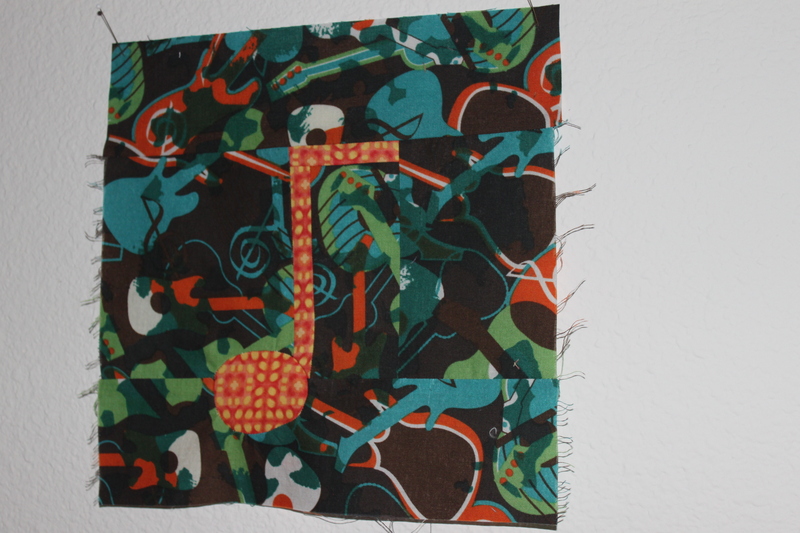 Valerie wanted a quilt that had to do with music; guitars, music notes, old records…here is what I came up with. It isn’t as fancy as I would have liked, but it was fun. I think if I have to do this again I’ll try to do some connected eighth notes.